I had a lot of awesome opportunities to talk to people about what we’re doing (in case you’re just joining us, we’re farming 1/10 of an acre in cut flowers and vegetables and are bumping up to 1/2 acre next year) and also got to listen to what others are doing in the local, small-scale farming industry as well. Farming is back-breaking work. It takes a lot of blood, sweat, and tears to produce a high-quality, marketable product. A grower or farmer who tells you otherwise isn’t doing it right. There is no such thing as “chemical free” farming. Everything on Earth is a chemical. You are a chemical. Oxygen is a chemical. Water is a chemical compound. You can farm without “synthetic” chemicals, but a farm can never be chemical free. Weeds are awful and a good farmer will do everything they can to keep the weeds at bay. Weed management is NOT an option, it is a requirement. At Finding Eminence Farm, we’ve busted our buns keeping ahead of the weeds. We don’t spray herbicides of any kind, we utilize landscape fabric, organic mulches, and collinear hoes to stay ahead of the weeds. (See #1 regarding “back-breaking work.”) If it’s hard to distinguish where the crop is in a bed of weeds, the crop is not growing at its full potential and you are receiving sub-par products. Weeds will always exist in any growing situation, but you should be able to tell the difference between crop and weed. Ultimately mother nature plays the biggest role in a farm’s production. It’s scary giving over control and knowing there are some elements you don’t have any say over. That being said, a smart farmer will do everything in their power to control weeds, irrigation, and diseases. At Finding Eminence Farm, we utilize drip tape, landscape fabric, and spray a crop if we’re about to lose it. We have put too much time and especially money into our plants to just “see how it goes.” We have mouths to feed and contracts to fulfill, so we’ll be damned if we don’t have a viable growing plan in place. So far, we’ve been able to grow without the use of synthetic chemicals for all of our produce and nearly all of our flowers, and we’re mighty proud of that. We keep extensive records on everything we plant which leads to a very educated decision-making process for how we price things. We know exactly how long it took to grow, water, and weed each crop and have done research to know what that crop is selling for across the country. We also take into account the added vase life, fragrance, and vibrancy that our flowers have over the stuff being shipped from Timbuktu. We hope to one day send our son to college, so we don’t just guess our pricing models. 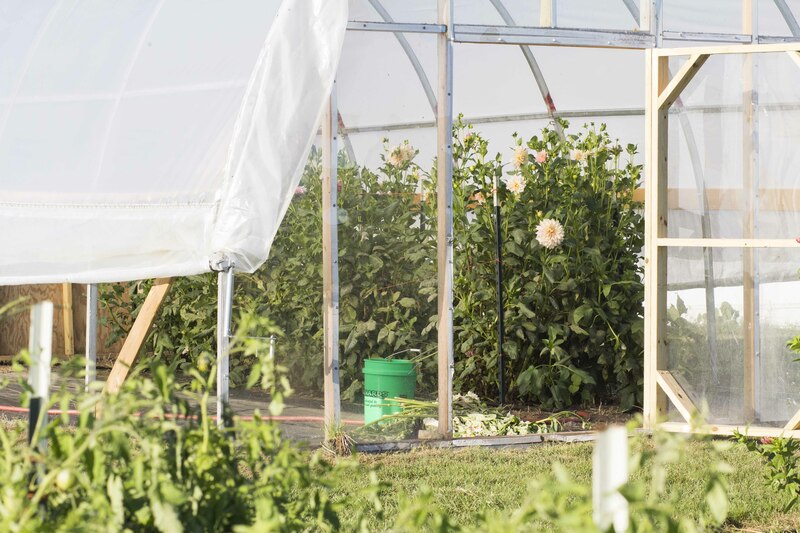 We have a hoop house to extend our growing season beyond the summer. Again, we’ve done extensive research on what plants go in that prime real estate. Everything we sell to you, we have grown. All of our flower varieties have been specifically bred for cut flower production. This ensures that you receive a high quality product that has been grown and processed correctly. Lastly, we believe that you should be aware of every part of our farming process. Which is why we have a website, not just a facebook page, where you can quickly and easily discover everything about us removed from the white noise of social media. We don’t believe in spouting off facts that are completely based on emotions, instead of research. We want you to be aware of our growing process to see we have nothing to hide. It can become easy for any grower to dodge questions or be false about origin. We think that our story matters. We want you to know where your food and flowers come from. There is no sort of professional designation that distinguishes a profitable, professional farmer from a hobby gardener pretending to be one. Unfortunately, it’s on the consumer to know what questions to ask about how their food and flowers are grown. So what questions do you, the consumer, need to ask? Well, we’re right here. Ask away. We have no secrets on this hilltop. We’re not afraid of helping out the competition. In our minds, the more of us there are, the more people will feel compelled to buy local and care more where and how things are grown. I’m so glad I found your blog! We are also in our first year of production as a micro cut flowers farm. Thank you for the words of advise and inspiration 🙂 You are doing an awesome job! Congratulations on your success. Hi! I am an event florist in southwestern Indiana with the dreams of one day growing a lot of my own product. I buy local when I can and grow as much as I can in my small, suburban yard for now. I grew dahlias for the first time this year and fought insects. Since your farm is not too far from me, I’m wondering if you have insect problems also? How do you fight them? Oh boy do we have insect problems! Right now it’s grasshoppers. We try to do an organic, proactive approach by spraying with neem oil extract. But as we were picking our Cafe Au Lait dahlias last night, we noticed the powdery mildew and insect damage rapidly got out of hand and was beyond an organic approach and had to spray with Rose Rx 3 in 1. We used this particular spray because we’re having mildew and insect issues. If we have just insect issues that are beyond the organic route, we spray Sevin. We try as hard as we can to be organic, but my dahlias are a perfect example of this. I’m about to lose my most valuable cash crop, and have had to turn away orders until I can get these back on their feet, so I’m going to do everything I can to try to save these guys. We have a really great nursery in town that gives us great advice on what we should spray when. If you have an extension office, they also can help identify what to spray for particular insect issues you may be having. Good luck and keep us posted on how it’s going! Thanks for the info! I agree. I try to go organic whenever I can but sometimes you have to do what you have to do. Grasshoppers, boxelder bugs, and aphids for me. It was an experiment for me this year with a few different tubers in pots and in my landscaping. I’m hoping to expand next year and eventually buy a few acres to experiment with! Thanks for the advice!